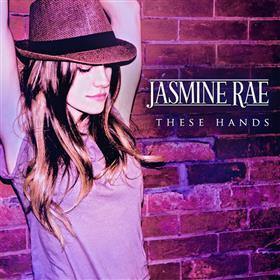 Following the success locally and internationally of her latest single 'Bad Boys Get Me Good' featuring special Guest Kellie Pickler, Australian Country Music's 2014 Female OZ Artist of the Year Jasmine Rae has released the stunning follow-up single, 'These Hands'. 'Bad Boys Get Me Good' went all the way to #1 on the CMC National Top 50 Countdown as well as the iTunes Country Music Video Sales Chart. The track also topped major Country Radio Network countdowns across Australia (peaking at #3 at Australian radio overall). This followed the success of the first two singles from Jasmine Rae's ARIA and multi-Golden Guitar nominated album If I Want To ('If I Want To' and 'Just Don't Ask Me How I Am') which both went all the way to #1 on both the National Country Radio & Music Video Charts. Not only did 'Bad Boys Get Me Good' top the singles charts in Australia, it also achieved music sales chart success in the USA. The song's music video appeared in the iTunes USA Top #20 Country Music Video in the last week of July, giving Jasmine Rae her first taste of major chart success in the huge US music market. While 'Bad Boys Get Me Good' showcases Jasmine Rae's fun and upbeat musical side, 'These Hands' presents an even more impressive layer of her artistry, showcasing the emotional depth and beauty of her lyrics and vocal delivery. The incredibly pure and loving core message of 'These Hands' is complimented with a tranquil melody, featuring a series of ascending key changes behind a poised and delightfully exposed vocal performance. "I love the simplicity of this song.To me it feels like a lullaby that could be sung to a child, a friend or a lover. The lyrics are expressing the absolute power of love and the depth's we would go to for a loved one in need." says Jasmine Rae. Jasmine Rae wrote 'These Hands' with Kathie Baillie and Michael Bonagura, who are celebrated members of the famous country band, Baillie and The Boys. The band had nine #20 singles on the Billboard Country charts in the late '80s and continue to perform regularly in the USA. Jasmine Rae has recently returned from an international writing trip and will begin a 20 show tour on September 3 as special guest for Adam Brand's My Side Of The Street National Tour. She has also recorded a new song with Brand titled 'Quit This Time' which appears on his new album release. Following that tour, Jasmine Rae will then appear as one of the headliners at the 2014 Mud Bulls & Music Festival in South-East Queensland on Saturday November 1.